The following is a statement given to a Newry paper by a spokesperson for Óglaigh na hÉireann (whom the media refer to as the Real IRA) and forwarded anonymously to a member of the editorial board of The Sovereign Nation. "On Sunday 15th July an active service unit of Óglaigh na hÉireann planted a bomb in the Upper Fathom Road area of Newry in the vicinity of the railway line. A booby trapped anti personnel device was also left in the area with the intention of killing members of the RUC/PSNI, only they know how lucky they were. 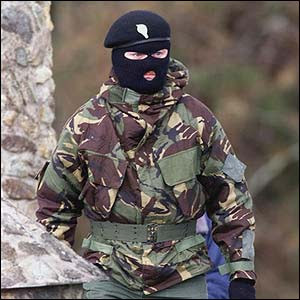 We reiterate our call to civilians to keep their distance from crown force personnel and facilities as more IRA attacks are imminent"
Well done! Hopefully they will continue with such attacks and have a little more luck on their side next time. "It means that in the midst of and despite the treasons and backslidings of leaders and guides, in the midst of and despite all the weaknesses, corruption and moral cowardice of a section of the people, in the midst of and despite all this there still remains in Ireland a spot where a body of true men and women are ready to hoist, gather round, and to defend the flag made sacred by all the sufferings of all the martyrs of the past." James Connolly, 8 April 1916. "There can never be peace in Ireland until the foreign, oppressive British presence is removed, leaving all the Irish people as a unit to control their own affairs and determine their own destinies as a sovereign people, free in mind and body, separate and distinct physically, culturally and economically." Vol. Bobby Sands, Irish Republican Army, 1981.